Triund was on my list from few months. But I was waiting for the right weather and travel partner to kick off the trip. So this green signal from my friend pumped me to plan the trip for the same weekend. The location as Mcleodganj and Triund was final, but arranging the transportation, hotel and trek camp in 1-2 days was a strenuous task for me to complete along with my office work. A travel specialist organizing the trip for me by understanding my travel needs, schedule and budget was my only hope at that time. After some research on the internet, I decided to go with travel platform HelloTravel and posted my travel requirements through their website. 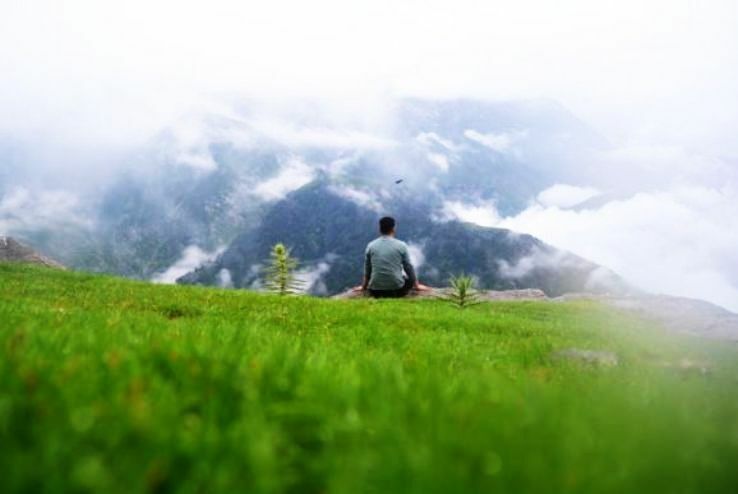 HelloTravel connected me with one of their best travel specialist- Pocketfriendly Vacations within few hours and I got the call and detailed itinerary as per my budget and schedule for 2Nights and 3 Days Triund Trek Tour. We boarded our Volvo booked by HelloTravel from Majnu ka Tila at 7:45pm. The bus was quite comfortable and unlike most private operators, it started the journey on time. At 7:30am, we reached Mcleodganj, 9 kms away from Dharamshala. The first look of the beautiful town was just magnificent and and I was all..speechless and breathless. There were a lot of foreign tourists around; most appeared to be backpackers. We reached our Hotel around 8:00am. As at most places, check-in doesn't officially begin until the afternoon, we were asked to wait for our room to be ready. Thanks to Deepak Lavania from Pocketfriendly Vacations, we were given another room till check-in time for no extra charges after he coordinated with the hotel staff. After getting ready for the day and having our breakfast arranged in the hotel, we decided to visit the popular attractions in Dharamshala and Mcloedganj like: Dal Lake, Mcleodganj, Himachal Pradesh Cricket Association Stadium, Dharamshala, War Memorial, Dharamshala, Tea Garden, Dharamshala, Mcleodganj Mall Road, Dalai Lama Temple, Bhagsu Temple. After full day of Sightseeing, we headed back to our hotel to take rest and conserve energy for next day trek. Of Course, we tried different lip smacking snacks Juicy Mutton Momos, Crispy Burger and Manchurian on the way. Tired from the previous day’s exertion, we woke up a little late. As the curtains rose, this is what Mcleod morning greeted us with. The trek camp and guide was arranged for us in our itinerary by HelloTravel and Pocketfriendly Vacations. We reached the assembling point at 10:30am where we started our trek in a group of 21 people. Just behind the Dhauladhar range stands tall Triund, a 9000 Ft range. The 9 KM trek trail on this mountain is a breathtaking experience. We reached the top in around 6 hours. The spellbinding panorama of the Kangra valley from the Triund peak is captivating. Camping near the forest rest house was banned at that time. Thankfully, HelloTravel and Pocketfriendly Vacations were able to arrange our camps few hundred meters away from the point. After having evening snacks and dinner, we went inside our tents to sleep. The sound of the rain overnight was eargasm. After having the morning tea and breakfast, we started the descent journey, which was much faster and mostly eventless. We reached down in 3 hours. Now the knee caps started hurting. Post-Trek, we roamed around Mcleodganj market for few hours. After having a good lunch, we reached the Mcleodganj Bus Station for our return bus booked by HelloTravel for the evening. After the tiring trek, we mostly slept and kept thinking of the mentally captured visuals the whole time during the return journey. After having our dinner near Una city, we went back to sleep in bus and reached Delhi early morning to join office and plan for our next trip!! I think no one would want to live and work in the city after spending such peaceful time in the mountains. Some goodbyes are really hard to say. If You are also interested in this tour as enjoyed by Gaurav, then please Call, Enquire or Book.